The Jersey Shore’s highest profile development is this 17 story mixed use modern marvel, across from the city’s famed boardwalk. The project, another transformative effort by iStar (the city’s primary developer), will include a 54 room luxury hotel; 130 luxury condominiums; 20,000 square feet of ground level retail (including a restaurant); a 411 space parking garage; and a plethora of unbeatable amenities. 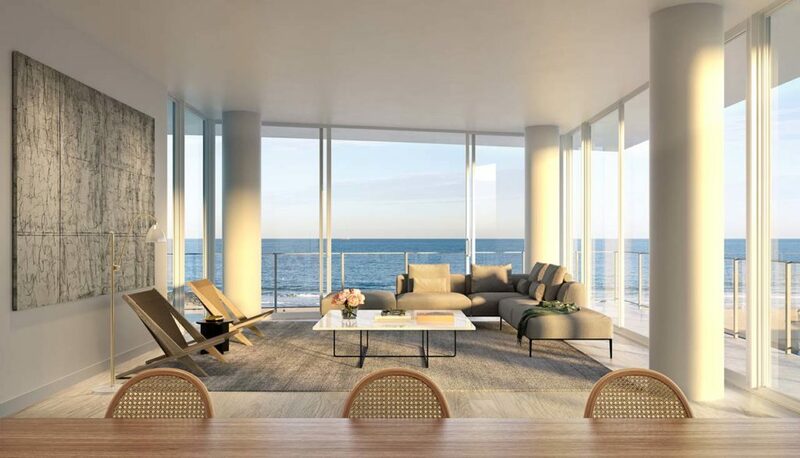 The property’s fourth floor a space that will be shared by residents and hotel guests includes a terrace with a 65 by 30 foot pool overlooking the ocean, a bar and grill, a garden with a reflecting pool, and an outdoor lounge with a replace. The hotel and pool are expected to open for Memorial Day. We were given an exclusive tour of the development in February by iStar senior vice president Brian Cheripka. The firm was named Asbury’s designated “master developer” in 2010, acquiring 35 waterfront acres where some 20 different projects have been undertaken. 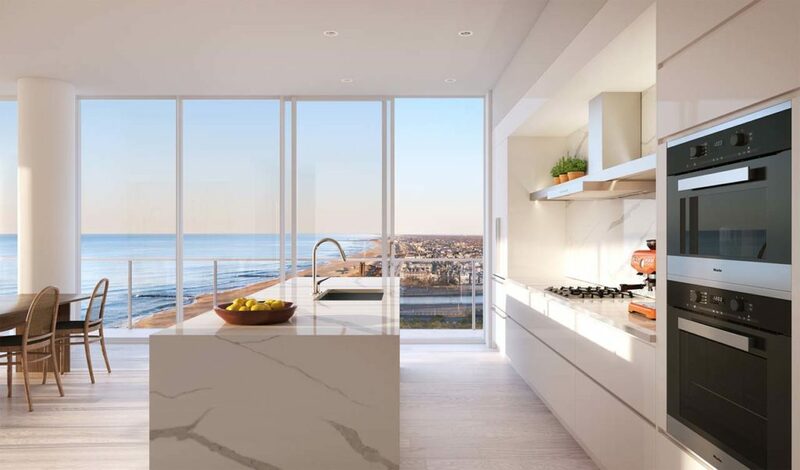 The chic, modern living spaces have floor to ceiling windows for panoramic city and ocean views, terraces, and such amenities as bleached white oak floors, engineered stone countertops, lacquered custom cabinetry by Spazzi of Spain, and Miele appliances. The building’s 24/7 concierge can assist with buying groceries, stocking refrigerators, making dinner reservations, and securing concert tickets (a real plus in this music mecca). The property was designed by Handel Architects and Anda Andrei Design, the same team responsible for iStar’s nearby Asbury Hotel. 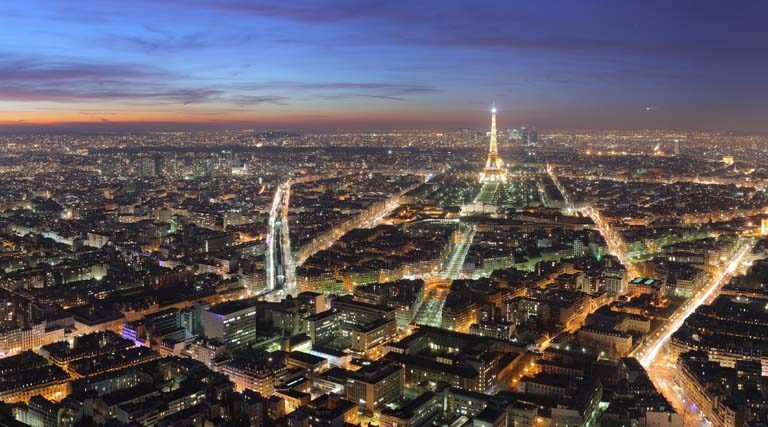 Among other features, the structure has been built to withstand hurricane force storms. An ocean view fitness center has a yoga room, a spa, and relaxation and meditation rooms. Children’s facilities feature games and activities, and there is an entertainment lounge, a 16 seat cinema screening room, a library, and a game room. An event room with a kitchen is available for private parties. There’s even storage space for beach loving residents’ paddleboards and surfboards. By 2020, residents will be able to enjoy a members only beach club featuring a pool, cabanas, a bar and grill, and changing facilities. Prices start at $879,000 for a one bedroom unit. Two, three, and four bed room units come in various sizes and at various prices. 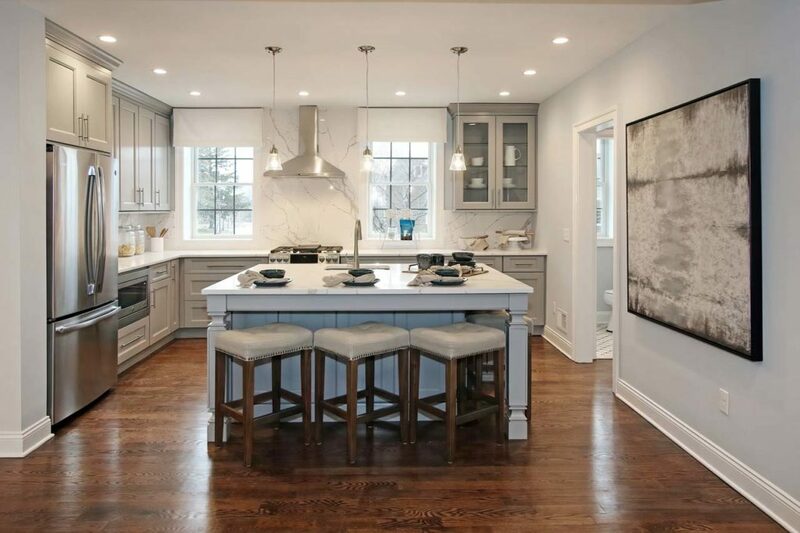 A three bedroom, 1,982 square foot unit was listed in March for $2,290,000. 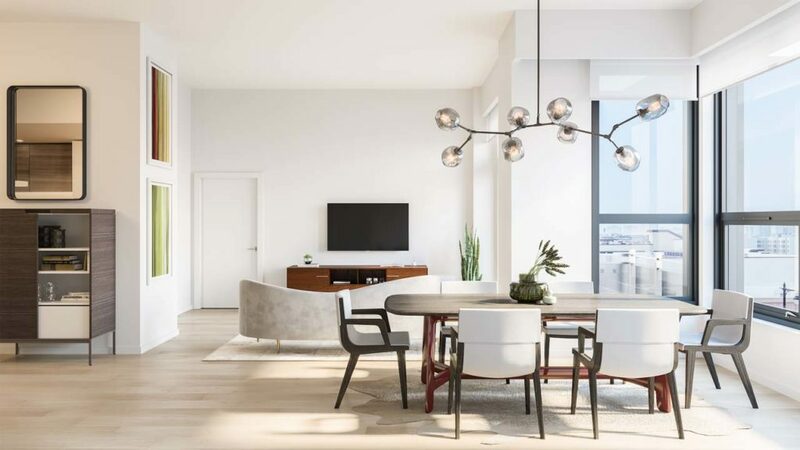 Taking its name from the former candelabra factory that once occupied the site, Candela Lofts offers a mix of high design, luxury, and advanced building performance. 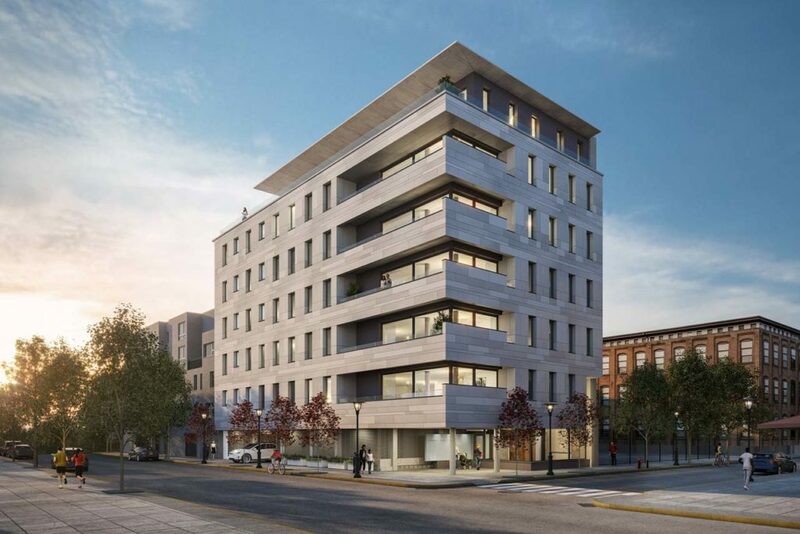 Developer Bijou Properties has created what it calls a “Passive House” multifamily building, emphasizing sustainability, advanced energy modeling, and integrated systems. Passive House is an international standard that helps building designers create durable, comfortable, and healthy buildings while dramatically reducing energy consumption through such “passive” measures as high quality insulation, air sealing of the building envelope, and the use of high performance windows (imported from Austria) and doors. 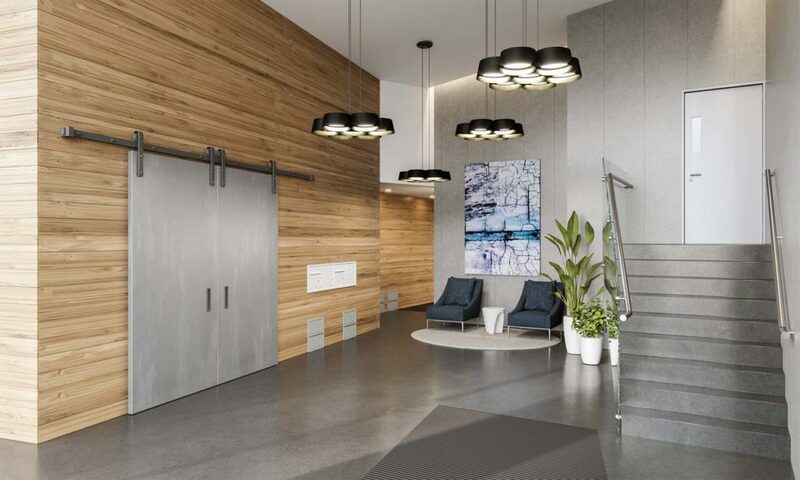 With only nine high end condos in a seven story building, Candela Lofts sits on the Garden State’s Hudson River Gold Coast. The contemporary building has been awarded a Leadership in Energy and Environmental Design (LEED) Platinum certification from the U.S. Green Building Council. 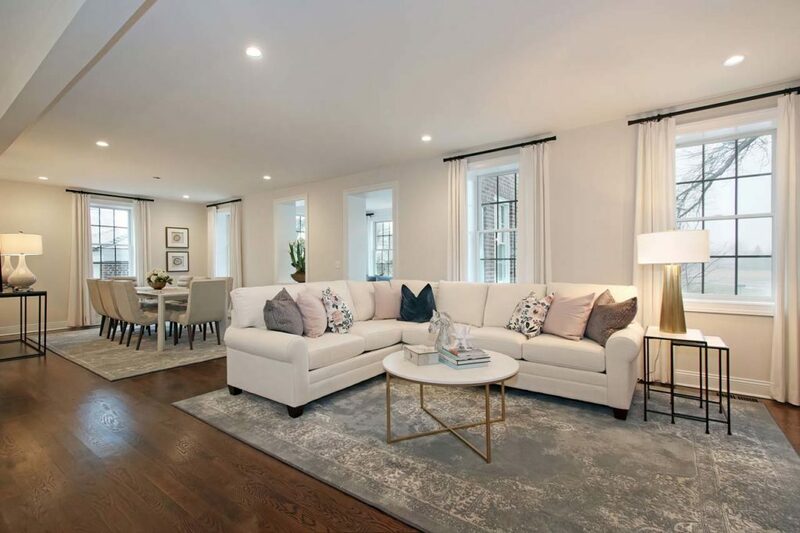 Available are two , three, and four bedroom homes with high ceilings, oversized windows, walk in closets, sleek cabinetry, Miele appliances, and private parking. Some of the homes have New York City skyline views. 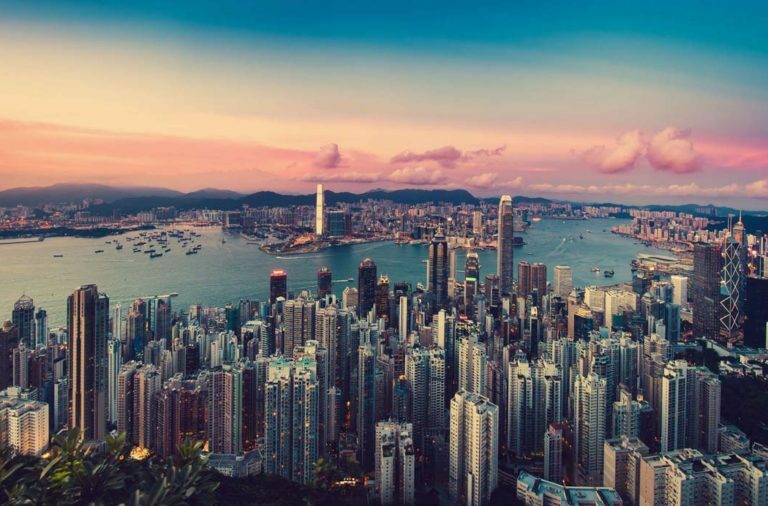 Bijou Properties, a leader in sustainable green development for more than two decades, crafted the development to meet the most rigorous worldwide green building certification. 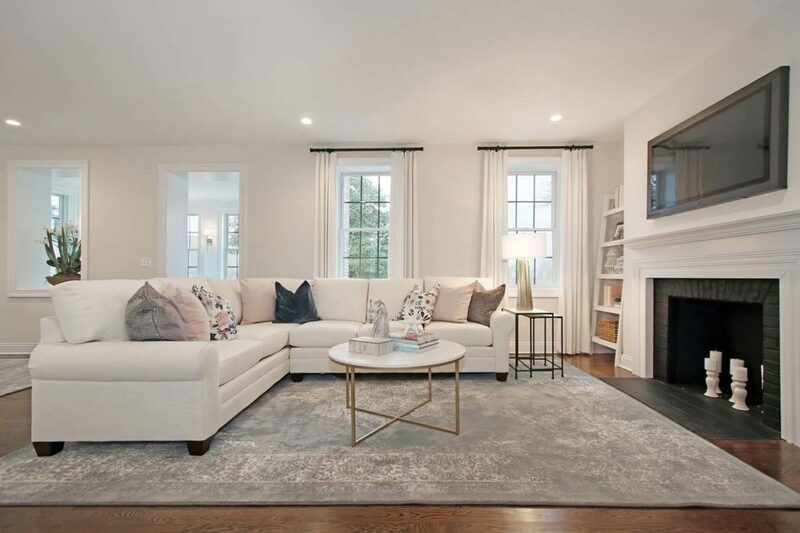 Residences, which range from 1,500 to 3,400 square feet, start at $1.595 million. “Novia,” short for North of the Viaduct, is a hip new neighborhood emerging in Hoboken near the 14th Street Viaduct, the cobblestone bridge to Jersey City and Union City. The area includes pedestrian and recreational spaces and soccer mini pitches sponsored by the New York Red Bulls. The city’s Bijou Properties, already responsible for residential, mixed use, and commercial developments in the area, is helping to build the buzzy vibe through new architecture and tenants. The firm’s offices are located in a renovated industrial building above a beer garden. The neighborhood also features a Trader Joe’s, a cinema, a rock climbing gym, and a popular Mexican restaurant. 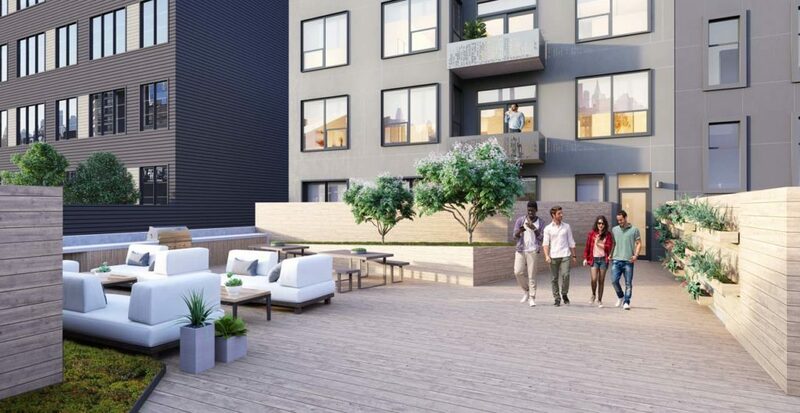 Bijou’s Via Lofts is a 10 unit contemporary, ecofriendly condominium set to open in early April. As with all Bijou properties, it adheres to the principles of sustainable design and construction for green buildings and has earned a Platinum LEED certification. Large, double paned windows diminish noise and increase sunlight, reducing air conditioning and heating needs at the same time. Specialized construction materials and no or low VOC paints and finishes are also used. Via Lofts also makes use of a high level of recycled materials, high efficiency plumbing, a green roof, on site rainwater harvesting, and landscaping done completely with native plants. There are only two homes per floor, enhancing privacy. 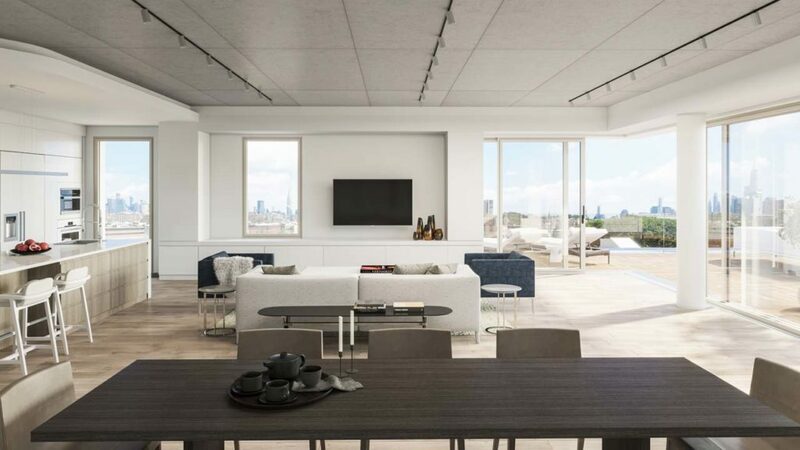 In addition to concrete ceilings that are more than 11 feet high, units feature top end Miele appliances, on site garage parking, individual storage units, a fitness center, a bike storage room, a landscaped outdoor terrace with a Lynx grill, and dining and lounge areas. 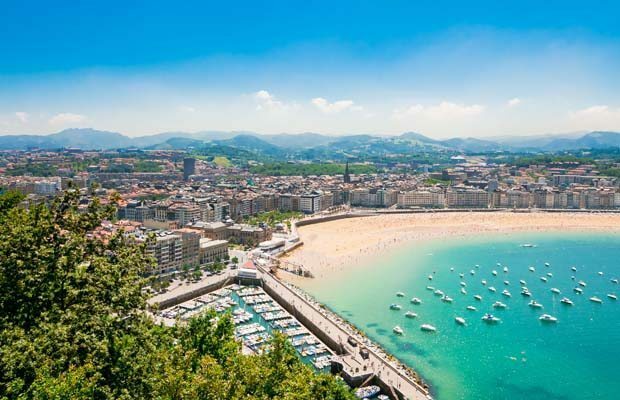 Two bedroom residences start at $1,195,000, three bedroom at $1,295,000. 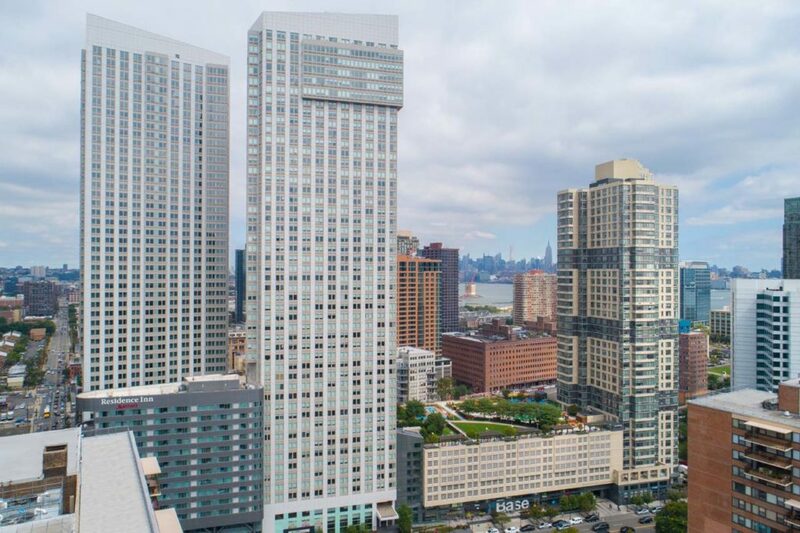 This new residential tower is the fourth and final phase of the Columbus Collection, a mixed use project jointly developed by Iron state Development of Hoboken and Jersey City’s Panepinto Properties that comprises 1,484 rental units, a 152 suite Residence Inn by Marriott, a 1,000 space enclosed parking garage, and street level retail space housing Base Gym and Sprove Market Place. The 51 story building sits at the entrance to the Grove Street PATH station. The partners tapped Parisian interior architect Noé Duchaufour Lawrance and international landscape designer Bas Smets to create a sense of nature throughout the communal spaces amid restaurants, shops, cafés, and nightlife destinations, which have views of the Manhattan skyline, the New York Harbor, and the Statue of Liberty. The building’s interior social spaces likewise embrace nature. The grand lobby is attended by a 24 hour doorman and full time porters. Green plantings grace a two story lounge and an expansive communal workspace. 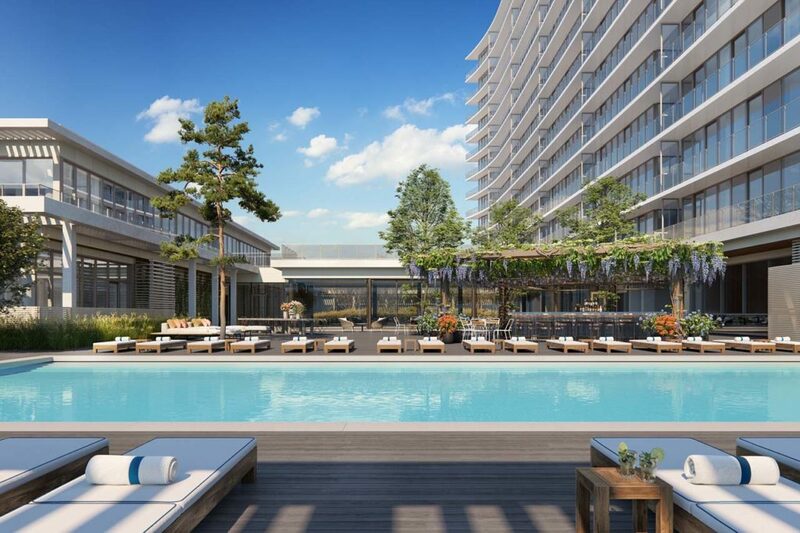 Residents who become members of the street level, 30,000 square foot Base Gym also have access to a 60,000 square foot outdoor landscaped roof deck, where there’s a pool, grilling stations, a sport court, a dog run, and a children’s play area. Residences include studios and one and two bedroom units starting at $2,695 per month. 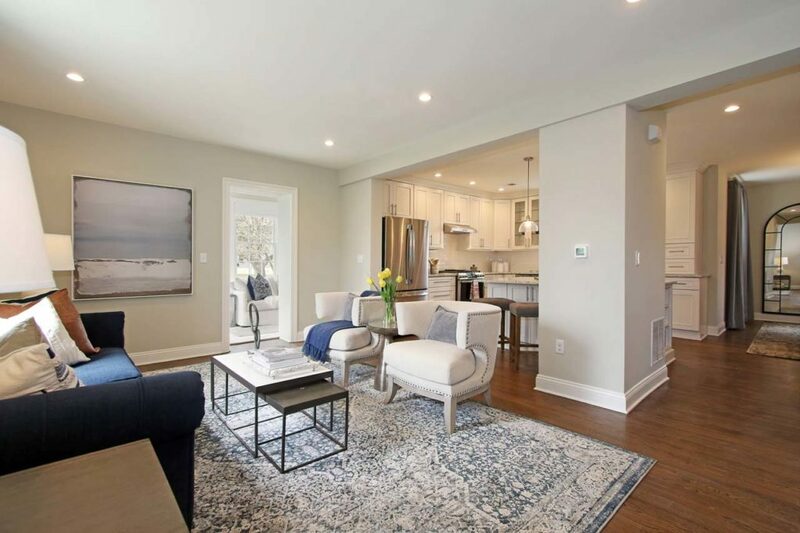 Living spaces are open, with high ceilings, oversized windows, and fixtures and finishes crafted of organic materials. Hardwood oak floors offer natural sound proofing. Chef inspired kitchens have gray custom cabinetry, white quartz countertops, tile backsplashes, and stainless steel appliances. Spa inspired baths feature white ceramic tile and pewter porcelain tile flooring complemented by Kohler fixtures. This impressive Downtown tower has already made history twice. 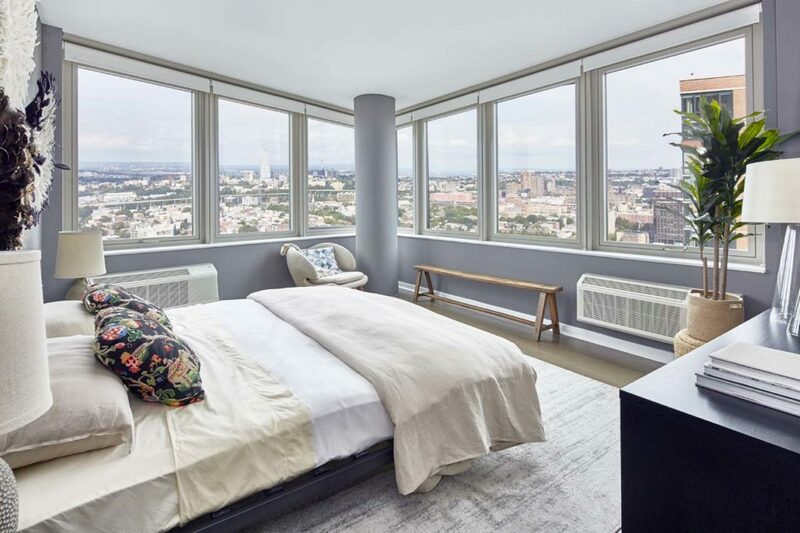 First, at 79 stories, it’s the tallest building in New Jersey, and second, two of its penthouses sold for the highest prices in Jersey City history a record breaking $1,775 per square foot. 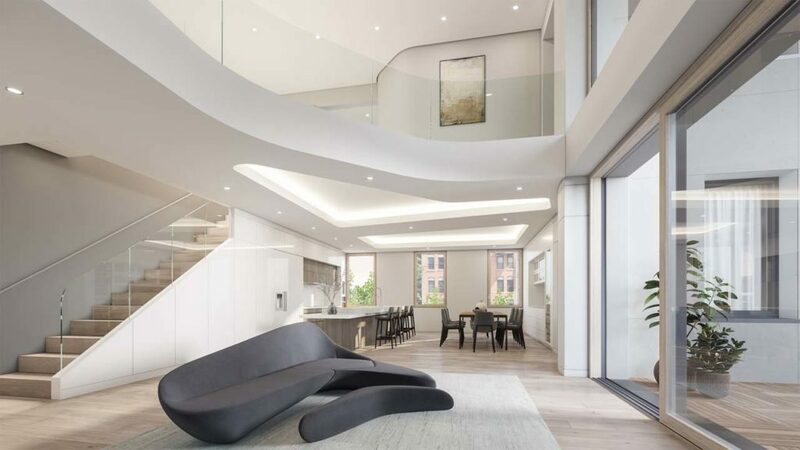 The 781 unit luxury condominium building, developed by China Overseas American Inc., was designed by Perkins Eastman architects and built by Plaza Construction. With a height that provides stunning panoramic views, the monolith is also the third tallest condominium building in the United States. 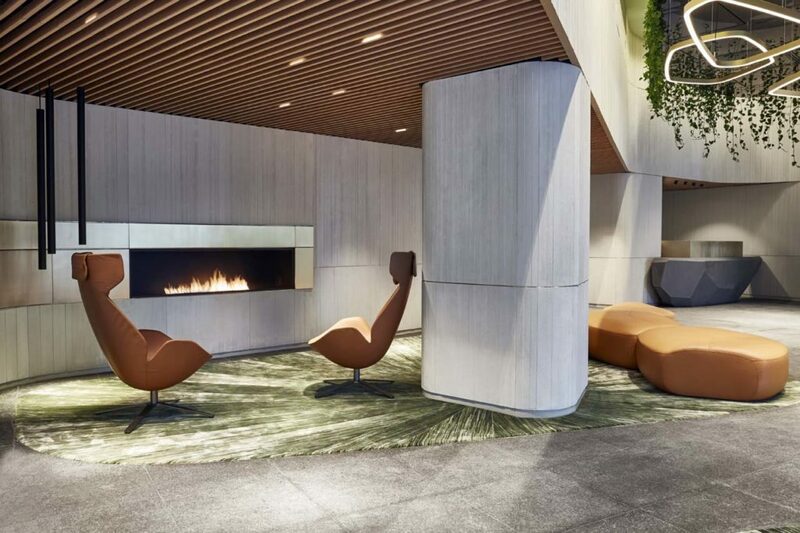 Located near the PATH station and the N.Y. Waterway Ferry Terminal, 99 Hudson offers a mix of upscale residences, a 65,000 square foot suite of indoor and outdoor wellness amenities, and direct access to 1,500 acres of water front park and miles of Hudson River biking and jogging pathways. Amenities include a private drive in entrance; a 24 hour concierge; a 3,000 squarefoot pool with cabanas; a club room; a game room; a golf simulator; a screening room; a children’s playroom; a business center; a state of the art fitness center with exercise studios; a spa with sauna, steam rooms, and a hot tub; dining areas; and outdoor space with a dog run and grill stations. 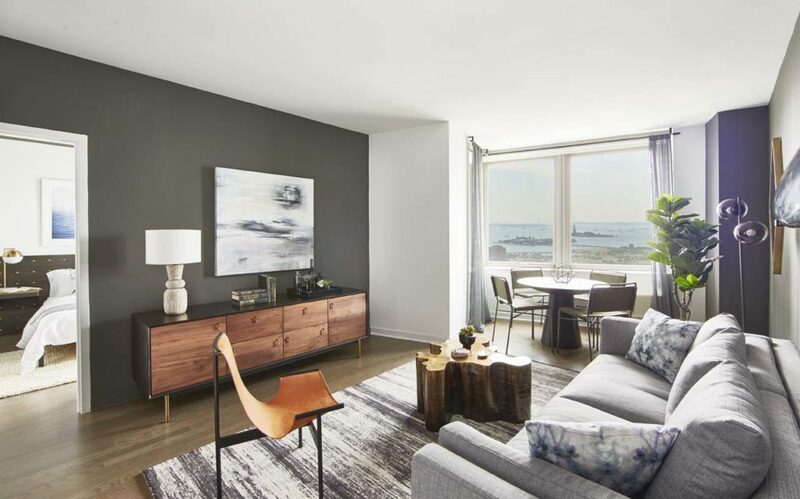 The condominiums feature open layouts with floor to ceiling windows; oak floors; custom gourmet kitchens outfitted with premium appliances; spalike bathrooms with quartz countertops, porcelain tiles, and ceramic backsplashes; Kohler fixtures; and premium washers and dryers. 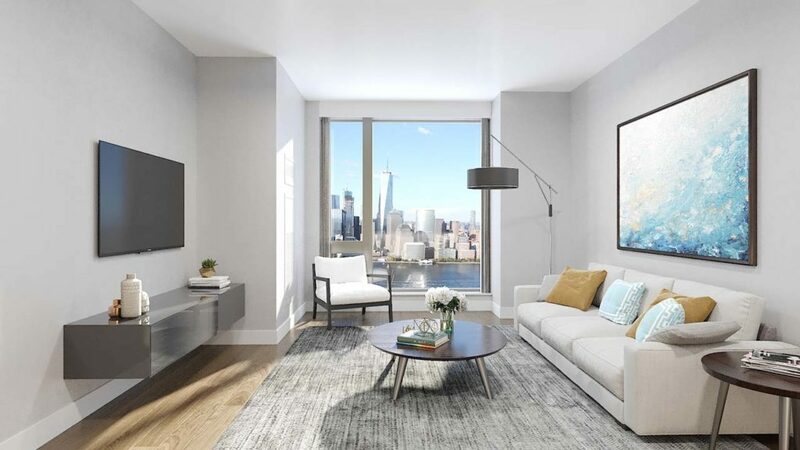 Units start with a 473 square foot studio for $557,000 and culminate in a 2,473 square foot three bedroom penthouse with two outdoor terraces for $3,764,000. This two tower, eight floor sandcastle designed to evoke notions of Miami Beach is nearing completion across from the boardwalk at Long Branch’s southern end. 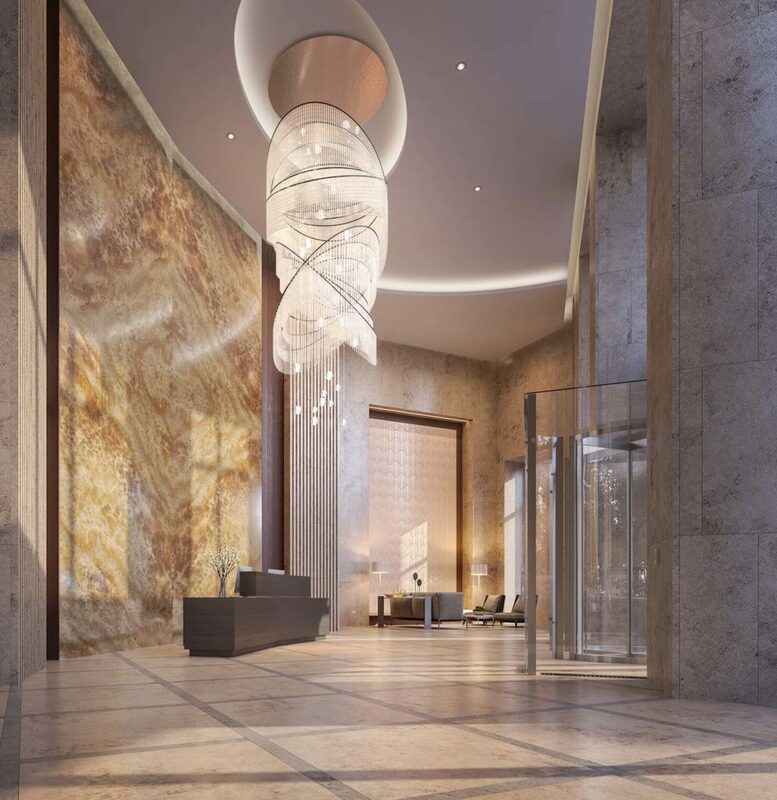 Located on 1.7 acres, its 47 luxury residences will range from 1,352 to 3,382 square feet, with a limited opportunity to combine residences to create larger living areas. With spacious private outdoor terraces, balconies, and patios, owners have plenty of opportunity to savor the open air, sky, and sea. 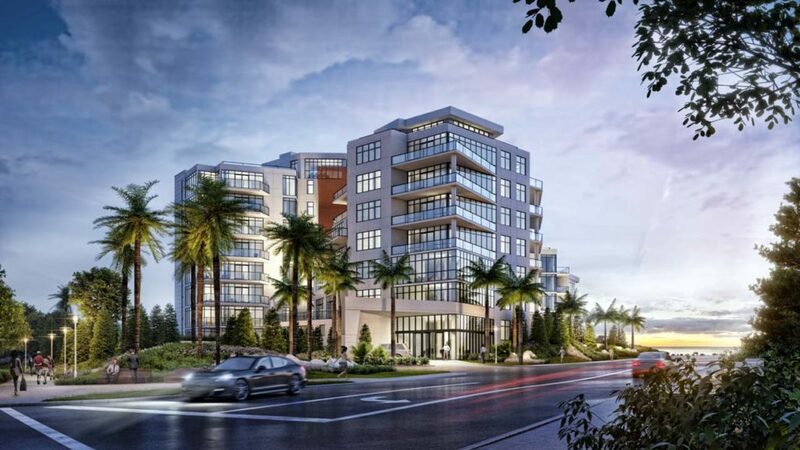 The project’s developer is FEM South Beach Urban Renewal, and the architect is Shore Point Architecture. From a two story glass lobby with a concierge, private or semi-private elevators access homes built to maximize the spectacular views. 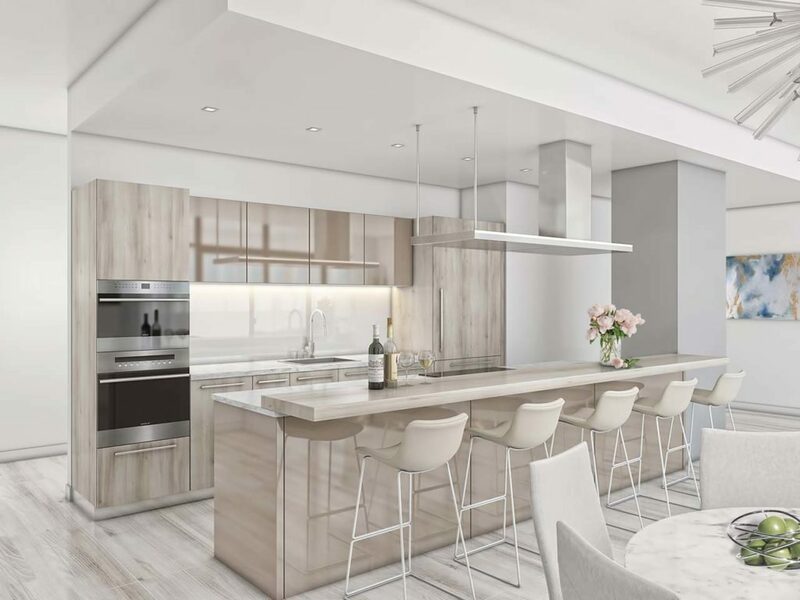 Each residence features expansive custom kitchens; top of the line luxury fixtures; wood, porcelain, stone, and tile flooring; and walk in closets. 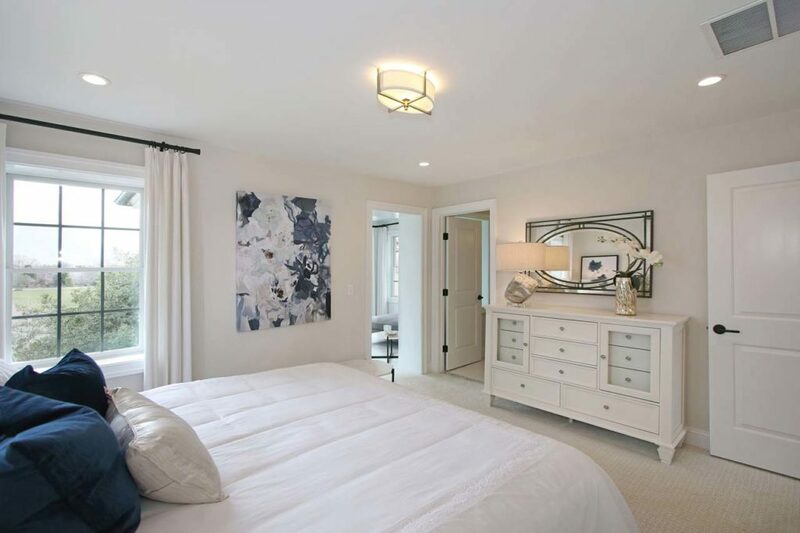 One to four bedroom units are available with between two and four and a half baths. Other amenities include a high tech 24/7 gym, a conference center, and below ground parking with two to three spaces per unit. Four hotel style guest suites with private kitchenettes have been included, along with a private dining room where chefs will prepare meals for residents and guests. The resort like exterior features a saltwater infinity pool with a waterfall, sand patio, grill area, and raised sundecks with landscaping and palm trees evoking tropical Miami all enhanced by direct access to a beach area with cabanas. Homes begin at $1.5 million. Imagine living in a uniquely conceived community on a historic 1,127 acre former U.S. Army base one that’s within minutes of the Jersey Shore. The first residents of the East Gate townhomes by RPM Development are already there. The homes, built in what was once housing for Fort Monmouth officers, are located inside the base’s entrance, next to its former Parade Grounds. The 68 homes duplexes and single family residences are being redeveloped and sold in phases. The first group was completed last year. Their neighbors will soon include an artists’ community, a bowling alley, a microbrewery, retail stores, restaurants, offices, an athletic club, and more. A golf course and county run recreation complex already exist on the property, which spans three towns Eatontown, Oceanport, and Tinton Falls. Oceanport town buildings will occupy a site near East Gate, so police and emergency services are already in place. Since the Officers Housing is part of the 100 year old fort’s Historic District, its brick exteriors were retained and improved. 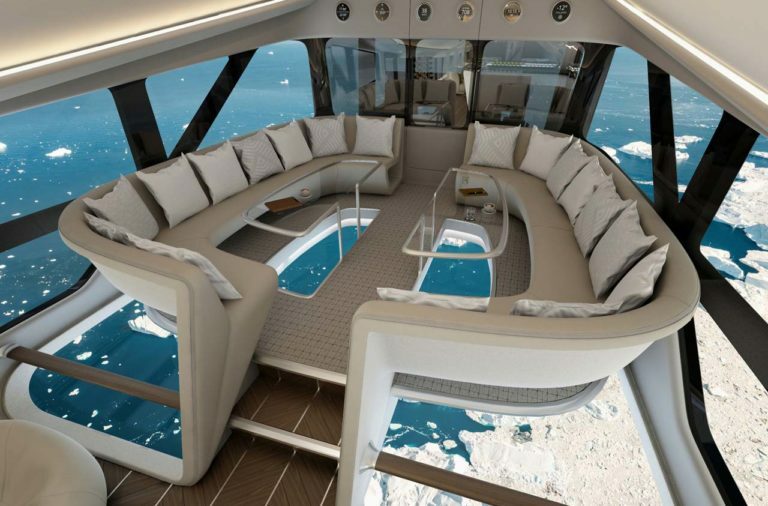 Interiors, on the other hand, were completely renovated and outfitted with top drawer modern amenities and finishes. The homes have hardwood flooring, modern kitchens with granite or quartz countertops, stainless steel Kohler fixtures, and GE appliances. Master bathroom suites are equipped with double vanity countertops, Moen Eva faucets, and showers with built in benches and frameless doors. Some units have sunrooms and bonus dens. A municipal park and the Marina at Oceanport restaurant and small craft marina (formerly the base’s marina) are within walking distance. New Jersey Transit’s Little Silver train station is just two miles away, and the nearest Garden State Parkway exit was upgraded specifically to accommodate the fort’s next incarnation. Prices for the two and three story residences range from the $500,000s to the $700,000s. Newark is experiencing an economic boom, a “megaproject” of which is happening at the former Westinghouse plant, where a billion dollar mixed use project will see a hotel, retail space, housing, and offices. Another project, Ironside Newark, will turn a 1907 warehouse into a state of the art office and retail destination. A major corporation, Mars Wrigley Confectionery, announced it will relocate its headquarters there from Chicago. Nearby, Riverfront Square, a 12 acre mixed use project at the former Newark Bears baseball stadium, will be “a new place to work, play, and live,” while the Art Deco building at 540 Broad Street that once housed the New Jersey Bell Telephone Company is being converted into more office, retail, and rentals. 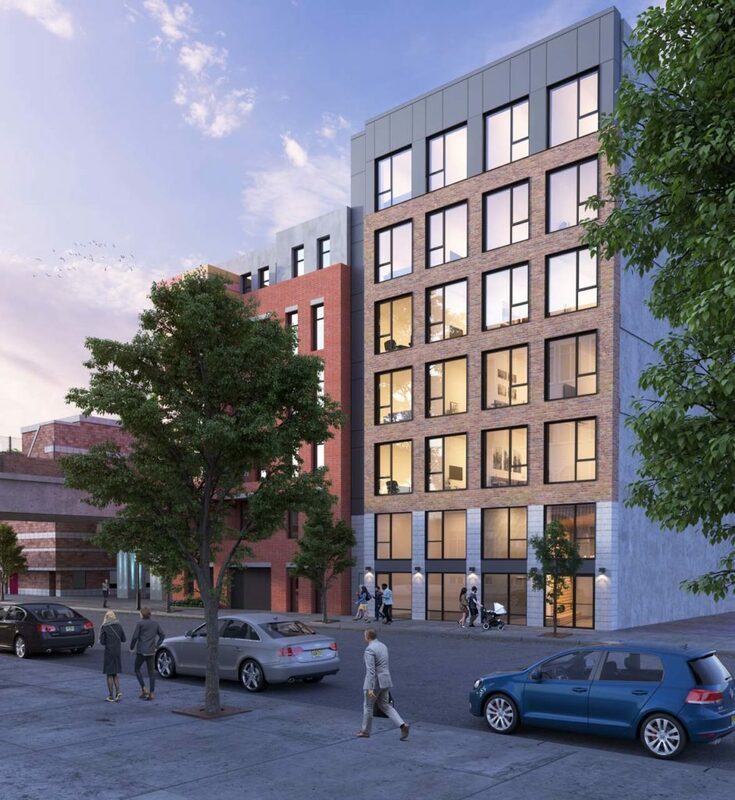 Joining the party is 325 Ferry Street, 91 upscale rentals in the city’s famed Ironbound section. Opening in March, it will include street level retail with a 5,000 square foot sports bar, a pizzeria, and a pet grooming salon. 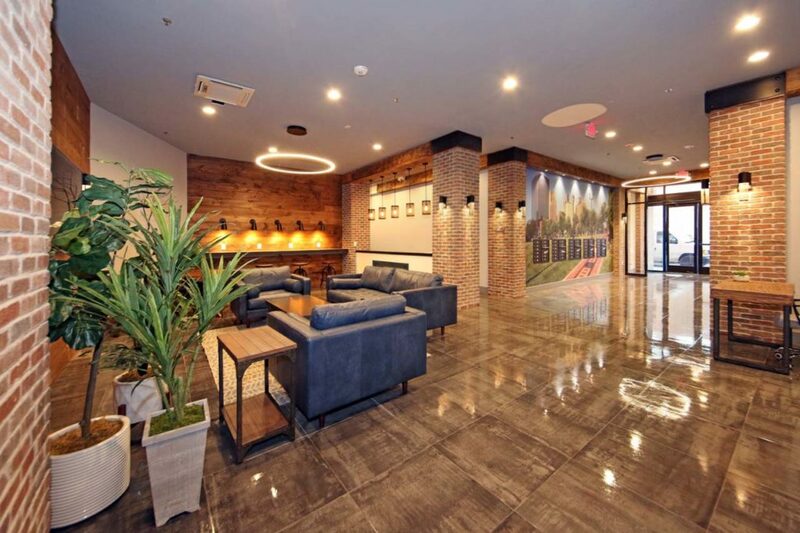 Residents will enjoy upscale amenities, plush living spaces, a high tech and energy efficient lifestyle, and a private shuttle to and from both Newark Penn Station and the Harrison PATH station. Renters can choose from seven one and two bedroom apartment designs ranging in size from 638 to 1,116 square feet. 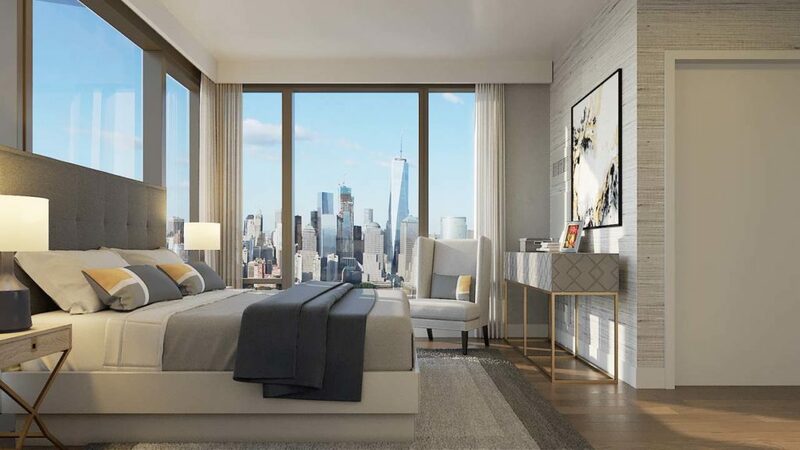 Units will be ultra-energy efficient, and some residences will feature New York City skyline views. The developers are the brothers T. Gary Gutjahr and J. Gordon Gutjahr. Open floor plans, expansive windows, insulated double walls, designer flooring, washers and dryers, and chef inspired gourmet kitchens with quartz countertops, oversized peninsulas, and GE stainless steel appliances are highlights. Master bedrooms have large walk in closets. Private outdoor balconies and dens are available. GigXero unlimited gigabit internet, an ultra-fast connection designed for reliability, flexibility, security, and super-fast speeds, is included. There is also a custom fitness studio; a lounge with a flat screen TV, Wi Fi, a coffee bar, and a fireplace; and an outdoor patio with a seating and picnic area, a fire pit, and games. Prices range from $1,750 for one bedrooms to $2,303 for two bedrooms.